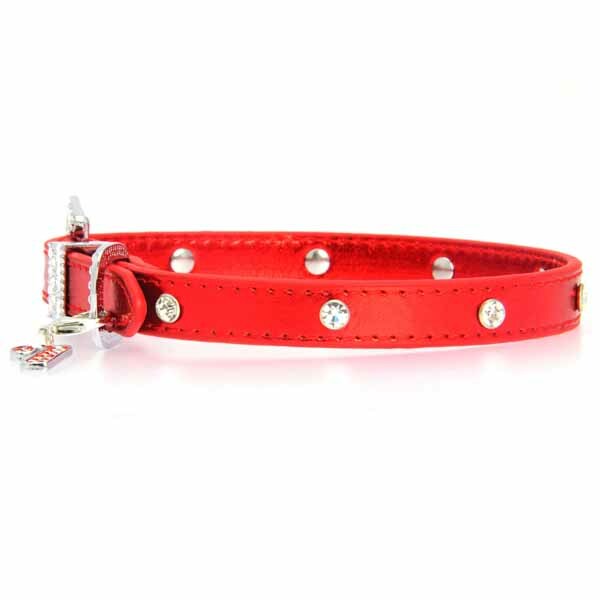 -- Select a Size -- 8-10" 10-12"
Dazzle your pet this holiday season with a gift of this sparkly collar from Cha-Cha Couture! 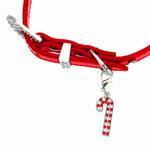 The Christmas Dog Collar with Candy Cane in Metallic Red is perfect for those with an eye for bling. 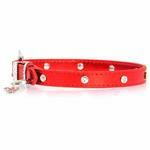 The candy cane on this dog collar are covered in high-quality crystals and the featured glam buckle dresses this collar up beautifully. Posted On 01/28/19 by Ronda from , OH Yes, Ronda recommends this product! I picked up several of these during the multiple Christmastime orders I had when they were offered as an add-on for a short time (likely a sign that I place too many orders, ha). These are BEAUTIFUL collars and so sparkly and the charm is an added touch/bonus - just right for the season and matches her festive sweaters so well! I'm keeping one for my Paisley girl, of course, but I kept adding them to orders while they were offered in different sizes that I'll be donating to our local Humane Society. After all, there's no law that says a pound puppy / dog shouldn't have some bling during the festive season, too, right?! Even they're shared among them for festive, "Adopt Me!" photo ops. Posted On 11/29/18 by Tammy P from Davidson, NC Yes, Tammy P recommends this product! 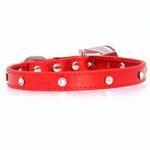 I bought two of these collars for my little black long haired chihuahua and chihuahua/poodle mix. They are about 12 and 14 pounds. When I first received the collars sized for 12-14 inch necks, they looked big. But, I tried them on and they fit perfectly. The collars are a bit wider width than this neck sized collars usually are but it didn't seem to bother my girls. The length is a bit longer, so there is room for adjustment if you have a pug or other breed that is small but has a thicker neck. The longer length means that the end is securely held in by the buckle and the little loop that all collars have to hold the end. It feels more secure than some shorter collars in this size. The metallic red shows up really nicely against their black fur. The jewels are set in bevels, so no sharp prongs to catch on fabrics or pry open. The buckle is quite substantial and full of jewels.. It's sparkly without being gaudy. The candy canes are just a nice little touch. Perfect holiday collars!